Home › Computer Terms › What Are Cookies? Session Cookie – This cookie lasts for a short duration of time. Session cookies are deleted if the user exits the browser or has not talked to the server for a certain amount of time. Session cookies are stored in RAM. Persistent Cookie – These cookies last longer than one browser session. Persistent cookies are also known as tracking cookies. The reason for this is that the cookie can track what sites the users goes to and sends that information back to its server. Persistent cookies are stored on the hard drive. Secure Cookie – this cookie is used solely when a user visits a server using HTTPS. HTTPS verifies and encrypts the cookie when sending it to the client. This allows added security for sensitive data and Internet privacy. Third-party Cookie – These cookies mainly come from ads on the side of a website. Third-party cookies are used to track browsing information, which allows advertisers to personally customize ads. They are placed on computers many times without the users knowledge and can lead to slow computer performance. Zombie Cookie – These cookies come back from the dead! No really, try to delete one and it recreates itself. Adobe Flash folders are used by the cookie to store a backup of itself and when the cookie is deleted it creates a new one. These can be removed by visiting a browsers website and using cookie removal tools. 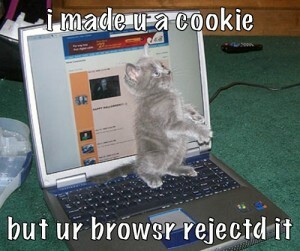 Not all cookie are bad, many cookies allow personalized web browsing. For example, if a user visits a coat manufacturers website and looks at only red coats. The cookie will store the information that only red coats were viewed. Next time the user visits the site the cookie will customize the web page to show red coats on the first page or other products similar to it. Free computer maintenance steps should be taken every now and then to ensure that cookies are deleted. Allowing cookies to build up can lead to a slow computer and compromised Internet privacy. Deleting cookies is easy and should be done on a regular basis. Always remember that too many cookies is never a good thing.